For exactly fifteen years now, the collective alien productions, founded at the occasion of the artists’ participation in the project 2000-3 ArtSpace plus Interface in Graz (Austria), kept their focus geared on external relations. This term may serve to summarize fields of interest, but cannot describe working methods, and much less the whole repertoire of applied instruments. A repertoire that ranges from embedded systems, via biofeedback-actions, on to the exact measurement of the human retina using professional medical equipment to serve as a mindreading technology, to arrive at productions dealing with long since faded working environments or the effects of Nazi terror in the tunnel system underneath Linz (Austria). 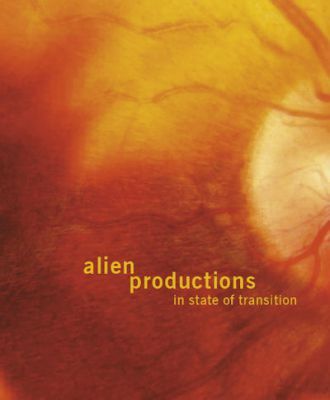 Carefully and reflectively, the artists have here taken stock of their projects, including collaborations outside the alien productions label. The resulting record determines their diverse and distinctive profile, which is central for the artists, who with unbridled energy and an approach of changing perspectives continue to develop it. But also important for the art scene in and from Austria: alien productions are unique, unrivaled in Austria. With their chosen approach, to (for example) anchor experiments not so much in the experimenters’ egotism, but to align them with the aim to improve a project’s information quality, it is possible to characterize (among other things) the quality of work, which is mainly measured via the vital, intensely active external relations. The reflection of the different systems, the crosslinking of analog and digital languages and the decision to define artistic action as a multilayered communication process: these are the pivotal points of alien productions’ oeuvre, and they surface time and again in intriguing cross-references.